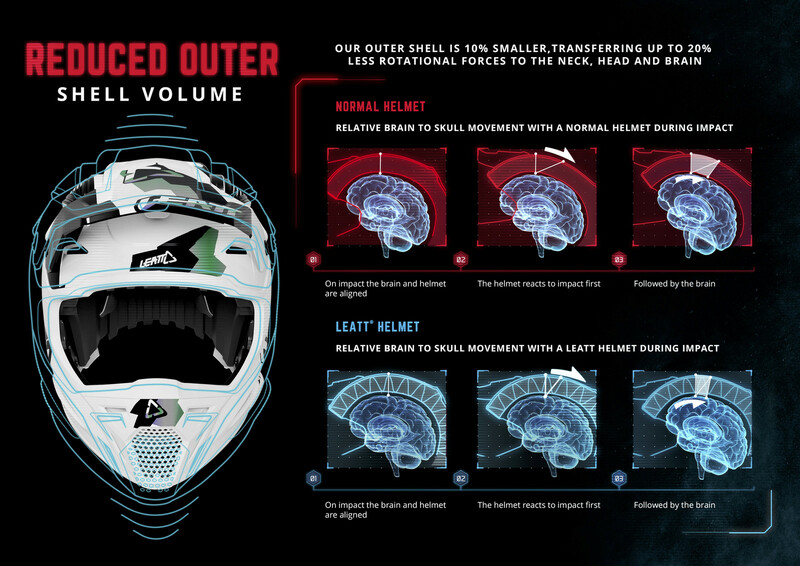 This motocross helmet has an arsenal of features that are working hard to keep your head safe. Talking about motorcycle helmets and how they should be built and certified is a little like talking about religion or politics. Things can go sideways fast. We aren’t jumping into that discussion (or debate, if you prefer) right now, just taking a more in depth look of how Leatt has decided to try to keep rider’s heads safe. For 2019 the style has been updated a little bit with new chin bar and visor designs but the overall shell and guts of the helmets stay the same. 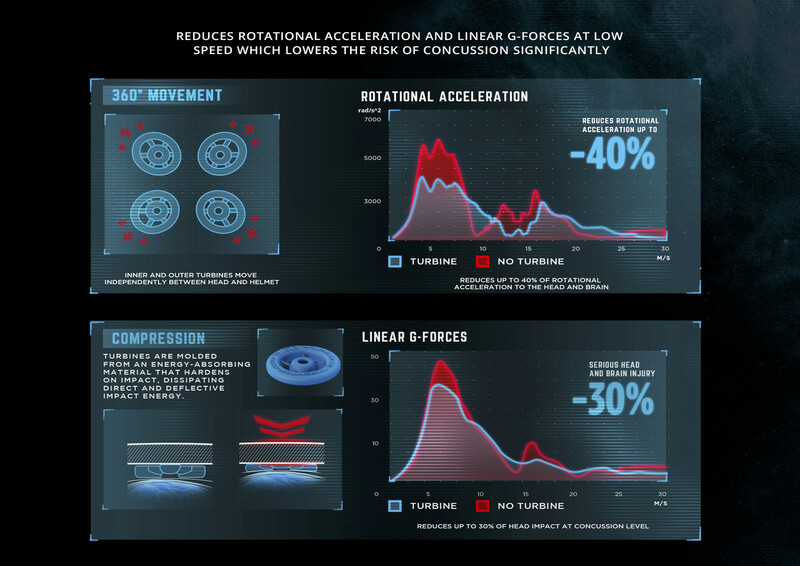 With 6D and MIPS bringing rotational energy to the forefront of helmet technology, Leatt created its own system to help mitigate twisting forces that can happen during a crash. They call it 360 Turbine technology. All along the inside of the EPS liner are circular turbines made with of a non-nutonian polymer that can absorb energy. These are secured only in their center allowing the edges to slide and squish, which should lower the amount of energy transferred to the rider. 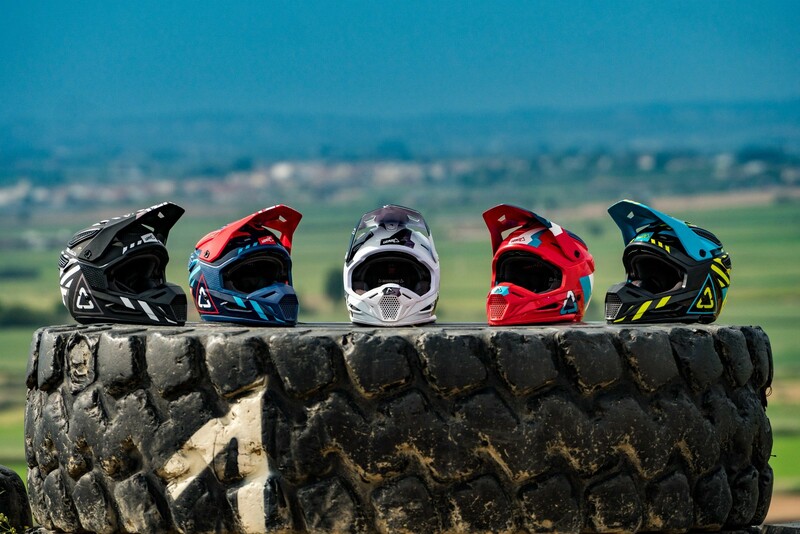 A noticeable feature of all Leatt’s helmets are how small they are. The overall size of the helmet has been reduced making it lighter and giving it less leverage when striking the ground. Typically, with helmets, the more foam liner the better. But, Leatt has scienced their way to a smaller helmet by using two densities of EPS that make “Vs” where they meet, which is supposed to absorb more energy than if they were flat against each other. They also in-mold the EPS, rather than having it molded separate and pressing it in, so there is no gap between the shell and liner. Most motorcycle helmets have some sort of intake and exhaust set up with their vents. Normally, this takes advantage of you and the helmet moving forward pushing air into the front intake vents. But, as we all know, in super tight and technical terrain, you aren’t moving very fast, meaning that those vents aren’t really doing much. 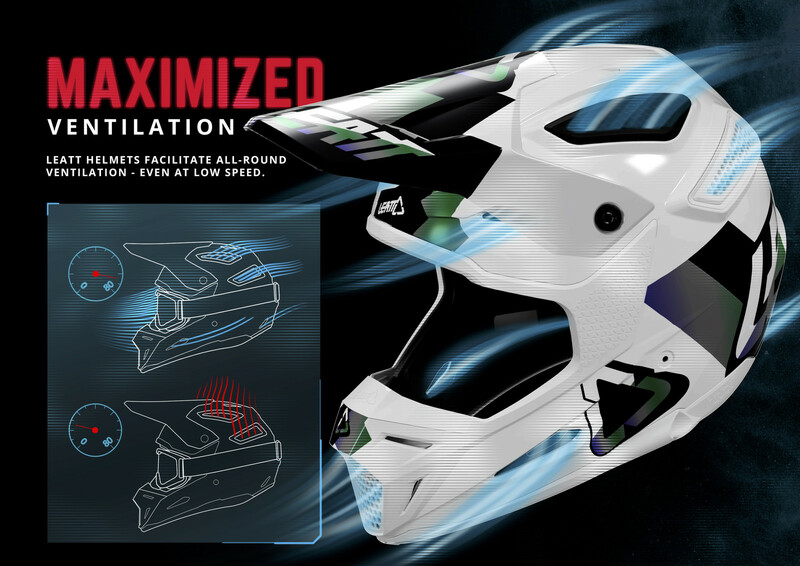 Leatt has taken the approach of using massive honeycomb vents on the top and back of the helmet that lets out hot air if you are moving or not. You might think those would be structural weak points, the helmet passes the DOT spike test with the spike striking the vents. The spike is 16 lbs and dropped from 10 feet up and it is designed to pass through any part of the human body. Pretty gnarly! We’ve seen this test in person and it is dramatic. Hydration packs are standard for off-road riding (and for “those guys” at the track) but you still have to take a hand off the bar to get the hose to your mouth. Another option is punch a hole in the front grill of your helmet and Mcguiver your hydro hose to the bottom with zipties, which is pretty common. But Leatt doesn’t want you putting holes in your helmet so they added a hydration hose channel on the bottom of the helmet. That way you simply slide the hose in and it is right in front of your face. I wish they would have had this level of protection when I rode.